We already have a ceros sander and just got a deros in, and I want to do some good dust extraction. Let’s just say that the method now is less than adequate and leave it at that. I’ve been looking at the Festool CT 26 or wondering whether to go with just a shop vac. Festool is supposed to be quieter but I don’t much care about that part since there’s loud equipment running other places anyway. These will be dedicated to the two sanders only so the start and stop function on the Festool would be really nice, and your going to have to do it manually with a regular Shop vac. My guys are constantly switching between the sander and hand sanding so there are a lot of starts and stops, so it would be a Festool kicking on and off or a shop vac running constantly. Other concerns are the price difference, at least 500 for the Festool vs. about 100 for a shop vac. Even if the festool is better quality would it outlast 5 of the Shop vacs? Another is the bags, I’ve not checked the prices of the Festool bags but evidently they are expensive. So, wondering what you guys use and how happy you are with the system. I’ve bought some Abranet also to try out on this new Deros sander. By the way, this is all going back to the question I asked a few weeks back about swirl marks and most responses I got were cheap paper or poor dust collection. Thanks in advance for the recommendations. We have the same sanders, and we use a shop vac plugged into one of those gizmos that start stop the vacuum when the sander runs. Probably get one from woodcraft or Rockler. I have a Fein vacuum for mine. Quiet, has the tool sense auto-start and is less expensive than the Festool. i have my ceros hooked up to a dust deputy and most of the dust falls in the bucket and never makes it to the filter. I only have to clean the shop vac filter every once in a great while. Also i heated up a 3/8 drill bit on the end that goes in the drill and pushed it in the holes on the ceros that line up with the mirka paper to enlarge the holes. It seemed to help with dust collection. I have the shop vac and dust deputy attached to a ply wood base on wheels so i can move it around. I also built a boom out of square tube aluminum that sicks up from the base and attached my cord and vac hose to the boom so my hose and cord come from over head. Mirka makes such a boom for this but is expensive so i built my own. here it is. I have a car rotor attached to the bottom of the base to keep it from being top heavy. The white piece at the end is a piece of 2" pvc pipe that lets me push hose in or out if i want to shorten the hose. 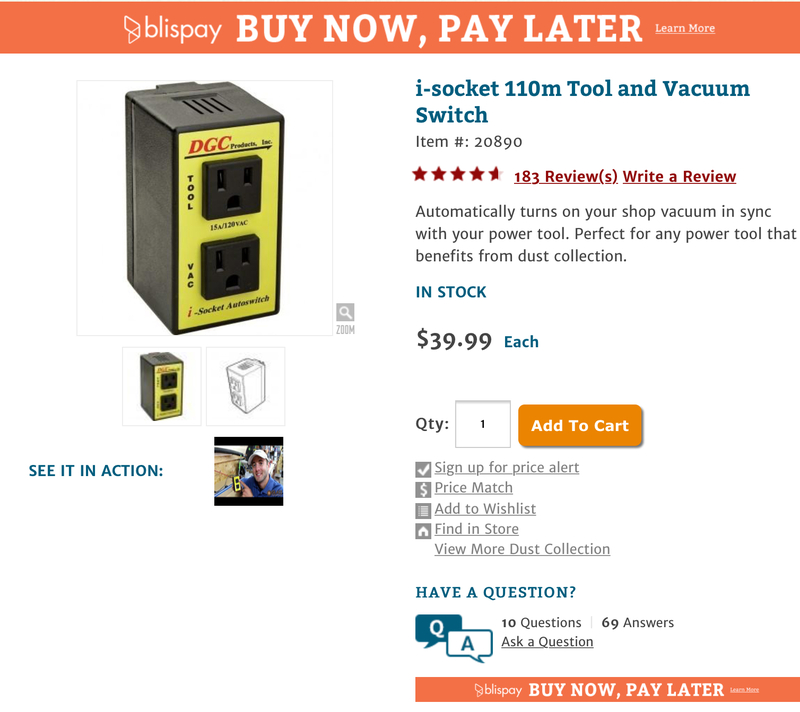 I have it plugged into a switch that is mounted to the boom that turns the vac on when the sander comes on. Also the boom is slipped over a steel rod that allows the boom to swivel on the base. I have 2 of the iSockets. They work well. Leo, I also read some reviews on the Fein turbo 1 and everyone says it’s quiet but they also say that the hose is the wrong size for almost all tools, did you have to configure a new hose? Pretty Sure I have the Turbo II and the hose end is 1 1/4". It doesn't fit the Ceros, but I also have a 10' section of 1" Porter Cable vac hose connected which fits perfectly. The hose length I have on the setup is pretty long along with the fact that I bought the longer DC extension cord for the Ceros. I can reach most of the shop with the sander while keeping the sander/vacuum setup central to my shop. You can see the transformer under the top of the sander cart, along with the vacuum. I can wrap the cord and hose onto the cart and move it anywhere I want because I put wheels on it. Worked out pretty well. The only thing I never put on there was a specific holder for the sander itself. I appreciate all the responses and info. Leo I like your set up and Nicko I like the overhead part of yours. Don’t think I’ll do the cyclone since I’m just using it for Sanders I I don’t plan on using a bag, I’ll just keep an eye on how full they get I guess. I was wondering what size hose it took to fit the sander, thanks Leo. I have the bigger one. I am on about my 3rd one in about 5 or 6 years. Except for the cost, the Festool is very good. I really like and need the air flow adjustment on the festool. Depending on the grit and paper type, sometimes the suction is just too much and seems to slow the sander down. Cause more problems. I believe they have a reusable filter bag, but I have never tried it to see how well it works. The dust deputy cyclone is really a great addition if you do very much sanding. I build cabinet doors and regularly sand for several hours at a time. 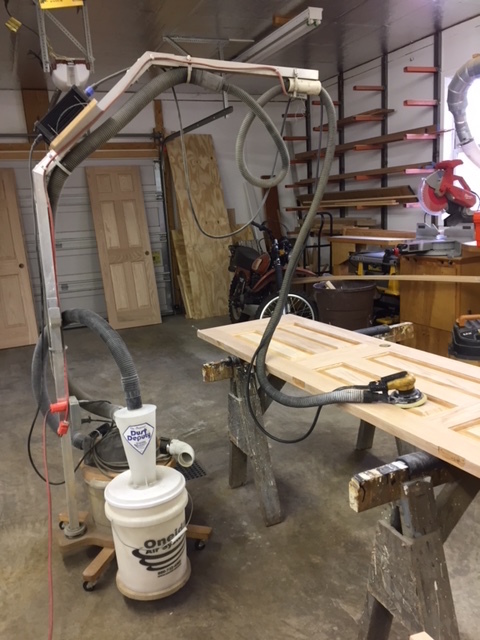 I used to have a shop vac hooked up directly to my sander. This worked great, but the filter would clog after a few hours and dust pickup would suffer. After I started using the little cyclone, this was no longer an issue. I can sand all day and see virtually no dust in the shop vac, with just a little bit in the filter. I was shocked at how well it worked. I also have the DGC I socket switch and it has worked good so far. Also my vac is a craftsman that was given to me about 8 years ago. It has countless hours on it and still works great. I would not personally spend the money on a festool unless you really need the compact footprint or quieter motor. I hadn’t thought about a separator but it makes perfect sense. I built one for an old dust collector that I used to have so I may make one. Curious to how you know when your bucket is getting full? It would be nice to have some sort of see through plexiglass panel on the bucket? Well I actually just bought the cyclone part and made my own collection bin, which is just a box made out of 1/2" plywood scraps. I mounted the cyclone to the lid. It takes a while to fill up with just sanding dust from the random orbital so I just check it once in a while. I like your viewing window idea-that would be easy to incorporate with some plexiglass to my collection bin. I may have to steal that one! I’ve got the I-sockets in and it works perfectly with the Deros sander but not with the Ceros. When the trigger is pushed the vac comes on for 7seconds and kicks off and the sander still runs. If you let go of the trigger for a few seconds and push it again then it will turn the vac on for 7 seconds again. If you push the trigger immediately after the vac kicks off it won’t come back on. It’s like the trigger is kicking it on and then off simultaneously since the switch is designed to make the vac run for seven seconds after the tool is turned off. The sander is probably 3-4 years old I guess, I’m wondering if the unit needs blown out? 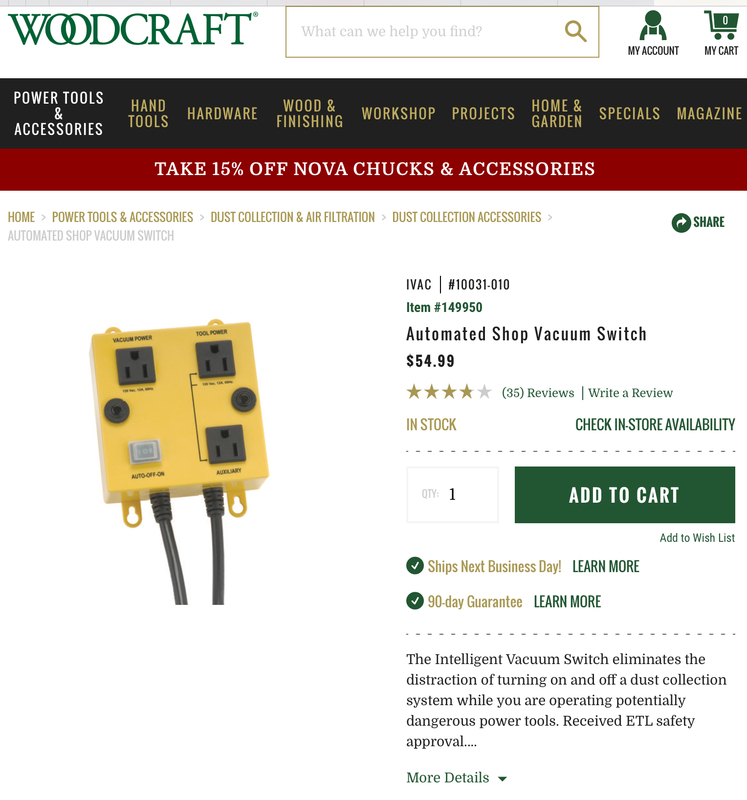 You guys that are using the Ceros on one of these switches have any thoughts? I use my ceros on a switch that i bought at sears. The vac will not come on when i run the sander at the slowest speed. I almost never run it on the slowest speed so it isn't really a problem. Otherwise it works fine. The vac kicks on when i turn the sander on and runs for a few seconds after the sander is off.